-filtering files by using the FilenameFilter interface. 1 Introduce the io package to the program. This package is useful as its contains some classes that are needed to get user input from keyboad (e.g BufferedReader, File,...) and to navigate through a directory. 2 Introduce the Scanner class to the program. The Scanner class has the nextInt method that the program uses to receive numerical choices from the keyboard. 3 The class variable dirpath is used to store the directory path input by the user. 4 The program begins from the main method. 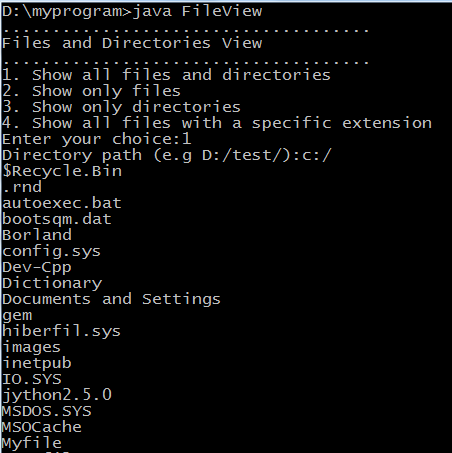 When the program starts, the FileView ff is create so that its methods can be invoked to perform their tasks. To display the program menu of choices, the showChoices method is invoked. The Scanner sc object is created to receive the choice input by the user. The switch case statement is used to detect the choice and do task accordingly. 5 The showAll method has code to show all files and folders. This method is invoked by the main method when the choice is 1. The showAll method invokes the getFiles method to retrieve all files and folders in a directory that input by the user and stores those files and directories in the allFiles array of string. Then the foreach loop is used to print all those file and folder name on the console window. 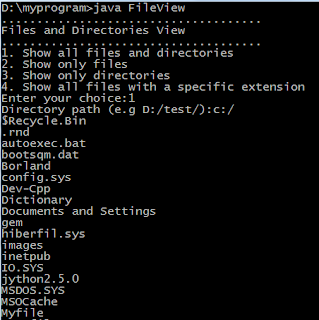 6 The showOnlyFiles method has code to show only the files in the directory input by the user. The getFiles method is invoked to get a list of files and sub-directories. To display only the files in that directory, the method isFile is used. The isFile method returns true to indicate that the file object is really a file. If the isFile returns true the file name is printed on the console window. Otherwise, it is not printed. 7 The showOnlyDirectories method has code to show only the sub-directories in the directory input by the user. The getFiles method is also invoked to get a list of files and sub-directories. The isDirectory method is used to check whether the file object is a directory before the its name is displayed. 8 The showFileWithExt method has code to show only the files that have a specific extension input by the user. To filter the file names based on their extension, the FilenameFile interface is used. 9 The getFiles method is invoked by the four method above. The getFiles method has code to retrieve all files, or sub-directories from a directory by using the list() method of the file object. This method has one boolean argument--withSpecificExt. If withSpcificExt argument has the true value, it is an indication that the user wants to show files with a specific extension. This case happens when the choice is 4. Otherwise, it is the case for choice 1, 2, or 3. 10 The showChoice has code to show a menu of choices to user. 11 The class Ext implements the FilenameFile interface. This interface has the accept(File dir, String name) method to filter file names based on its extension. The object of Ext class is created and used in the case that the user wants to show the files that has a specific extension.